I don’t have to tell you that a safe jack stand will take you one step closer to the safe maintenance of your vehicle. There have been many instances where not using proper jack stands while carrying out maintenance resulted in the deaths. However, if you can get the best jack stands for your cars, you not only get away from these tragic incidents but also have a smooth maintenance time. Don’t waste your life when you can easily grab a pair of these nice jack stands under $100. Before we go into the reviews of each of the top rated jack stands, let us have a quick glance at our top picks. We think you will be able to make a choice from the below table to choose a safe jack stand for your need. I know you might have spotted a god jack stand for your purpose from the above table. But we recommend you to first understand how good they are before making a purchase. That’s why we have reviewed each of those jack stands below. We will see each of the 7 jack stands in more detailed to help you make a good investment. 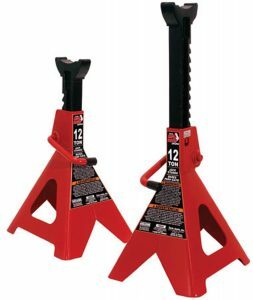 We didn’t have to think twice to place Torin Big Red Steel Jack Stand as the best valued one among our picks. Hundreds of Thousand happy customers who used this product say its the best jack stand they can ever think of. The main reason behind the massive acceptance of this stylish red and black colored product is none other than its low cost. This is the most affordable jack stand you can buy without thinking about the quality. Is there any compromise on its quality when you’re having a lucrative price offer? No, never. It is designed to last long and as per the tests, it never fails at the specified load strengths. The jack stand has a welded frame design made up of high-grade forged steel. The one-year limited warranty you get with this product is a matter of joy. But let me tell you that you might not even require it. Such is the quality of the product. The red colored jack stand comes in 4 size options -2 Ton, 3 Ton, 6 Ton, and 12 Ton. You can choose the size depending on your vehicle’s weight and requirement. A variant of the product-T43002A enhances the safety standard of the jack stand with its double locking option. 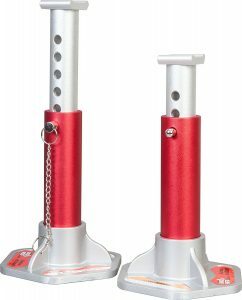 The most bought and loved product by customers, Torin Big Red Steel Jack Stand is an easy to use a jack stand. You will love using it and the best thing is that it doesn’t cost you much. Lightweight and easy to set up, this Aluminium jack stand is a must-have accessory in your RVs and campers. The second one product on our list is Camco Olympian. This is the best jack stand for RVs and Campers. Thanks to the material- Aluminium, this is the lightest jack stand you can buy at an affordable price. The lightweight and small size might make you doubt about its stability. But don’t question the stability of the jack stand. 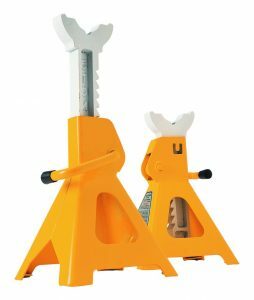 It is one of the most stable jack stands you can get from the market. Each jack can support 6000 lbs. They are very small and are very easy to set up. It gives you height adjustment ranging from 11″ – 17″. 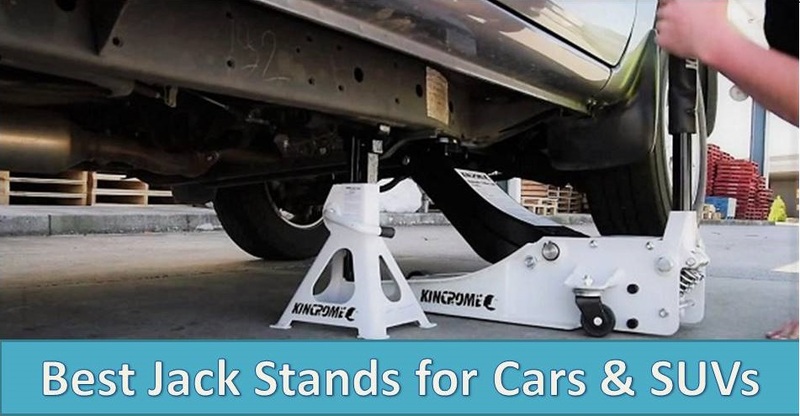 Moreover, these jack stands are stackable, making it very easy to store in your RV. It is available in two packages – set of two or a set of four. Set of two is more than enough for SUVs and cars; the latter is the best option for RVs and cargo trailers. After all, it is designed for RVs and works great for them. If you have a large RV, it is a good idea to get at least 8 numbers of these large jack stands. You will need at least four on each side. Great jacks to stabilize your RV, the product is rated as excellent by 90% of the customers used it. Definitely, a great buy if you are looking for a light jack stands for your RVs. Powerbuilt 640912 is designed for people who need a hassle-free working. The Powerbuilt 640912 is for those who are looking for convenient and sophisticated designs. All in One product comes with a bottle jack and jack stand. You don’t have to worry about jacks and jack stands separately. The unique patented design they have incorporated in this amazingly great piece is worth buying. You will never be disappointed with this product. It has a weight capacity of 3 Ton and is ideal for light vehicles, SUVs and light Trucks. The manufacturer has made it sure that you get the best features with this jack stand and jack unit. You will get a convenient height range of 11 inches to 21 inches. The safety bar lock is placed at desired heights. Unlike all other products featured in our top jack stand list, this one has a stable wide steel base. The base is 9″x9″. Yeah, that means you will have good stability when using it. The convenience factor is something worth mentioning about this all in one jack stand. It is lightweight and compact. You can easily move it around when in need. That’s a big point considering how heavy some of the jacks nowadays are. A better mechanism for lowering the vehicle would have improved the convenience a bit more. If you’re not a fan of using new things, especially something which are harder to comprehend first, then it is not a good idea to buy this one. You might find it a bit hard to use it in the initial days. We have seen a few complaints from users on its operation. However, if you’re comfortable handling new things with ease and follow the instructions manual correctly, this is definitely worth having. Although they are selling the jacks separately, we recommend you to buy the all-in-one option. As per their standards, it’s very reliable and a good product to have. You can use it for almost all the conditions. Powerbuilt 640912 is well accepted by the customers. Thanks to its unique patented design and ease of operation. If you’re looking for a combo of jack and jack stand, there is no better product than this awesome piece. With the patented double locking mechanism; this is one of the safest jack stands in the market. Very easy to clean, safe to use and durable, it’s a monster to have in your garage. Strongway Double-Locking Jack Stand is the most rated one among our top jack stands. The well-engineered design and sturdy finishing are the highlights of this double locking jack stand. Not many jack stands offer you the double locking for extra safety and security. But this one does that too at an affordable rate. What more do you want? Even the look of this quality jack stand is pleasing. It has got a nice and heavy duty appearance. The weight of the product stands with its appearance. Yeah, these tall jack stands are not lightweight. They are made up of high-grade steel to last longer. Moreover, to prevent rusting, Lead-free paint finishing is applied to the material. You can use it safely for light vehicles and trucks alike. The rugged jack stands have large base support of 10 4/5in. x 9 29/64in., making its support stronger. Even the welding work is done in miraculously that you will never fear using this awesome product. Another highlighting feature I loved about this one is it’s easy to clean nature. Since the outer covering of this steel jack stand is oil, grease, and dirt-resistant, you will never waste any timing cleaning it. It is very very easy to clean and I bet that you will love doing the cleaning part. The top quality design coupled with the affordable price makes this the best rated jack stand in the market. The solid jack stand is rated the best by more than 95% of the customers who bought this beast. Very easy to move around and comparatively larger in size, this is the best jack stand for low cars. You will never complain about the maneuverability of the jack stand if you’re a happy customer of this product. Yes, the Big Red Aluminium jack stand is very lightweight at 5 pounds each. Thanks to the nice robust design. It feels thick and is very sturdy. The nice finishing style is something that makes it a class apart from other jack stands of the same price range. The Aluminium jack stand will look great in your garage. One great aspect is that it will never corrode as it is made up of Aluminium. The large foot base size of 7.48″ by 6.81″ ensure equal distribution of weight and thus avoiding any unwanted incidents. 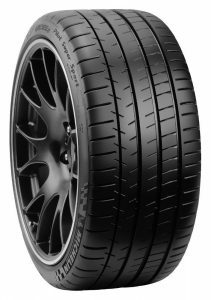 It offers a nice lifting range from 10.71″ to 15.63″, which is more than enough for cars and SUVs. They are rated for 3 Tons weight. The minimum working range is what made this one a great product in the market. You won’t see much jack stands to provide low working range like this one. That’s why Torin Big Red Aluminum is rated as the best jack stand for low cars like BMW, BENZ etc. Although the product demands assembling from your end, it is not rocket science. The process is very simple and you need nothing more than a screwdriver. One key thing to note is that these jack stands are way taller than how they look in the picture. 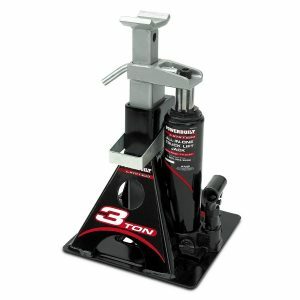 Torin has made it sure that this is one of the safest jack stands available in the market. If you’re using this jack stand, there is no room for fear while going under your favorite vehicle. It comes with a pin having ball detent. You need to insert it and it will never slip out. The second most rated jack stand in the market, Torin Big Red Aluminum vouches for its great design and safe operation. More than 95% of its existing customers recommend it to their peers. This is one of the best car jack stands if you own a low car! Rated as one of the best heavy duty jack stands, this one is a good choice for cars and small trucks. As the name suggests the Performance Tool Heavy Jack stand is for heavy duty applications. You will get three variants of the product- 2 Ton, 3 Ton, and the 6 Ton. If you’re looking for a jack stand for heavy duty trailers or trucks, go for the 6 Ton product. W41023 6 Ton variant gives a height range of 15-1/2″ to 23-1/2″, whereas the 2 Ton variant gives 10-3/8″ to 16-3/8″ height range. The height range gives you plenty of room to work with. The key highlight of these large jack stands is the heavy duty construction. They are made of sturdy and durable steels. Moreover, with the wide base, you don’t have to worry about the stability of the jack stand. These stands will last a lifetime. The robust product has very good welding work done on it. Coming to the weight, they are substantially heavy. But don’t worry. You will not break an arm moving them. They are designed to be a bit heavy so that they are strong enough to hold designed loads. Powerbuilt Heavy duty jack stand is a beast when it comes to strong and safe jack stands for heavy duty vehicles. More than 95% of the customers recommend it for heavy duty applications. If you’re looking for an affordable jack stand for heavy duty applications, you will not get a better option than Cartman 3 Ton Jack Stands. 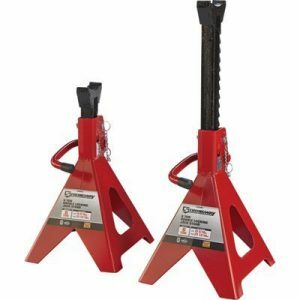 Cartman 3 Ton Jack Stands comes in pairs of two heavy duty jack stands. They give you a lifting range of 278mm – 415mm. The best thing about this jack stand is its price. I think they are the cheapest jack stand you can get for heavy duty applications. When I say ‘heavy duty’, it doesn’t mean heavy duty truck or trailers. You can use it for heavy cars for the best results. With the lightweight, you might doubt its capacity to hold a 3 Ton weight, but you will be wrong. They are strong and will last longer. You have to have a look at the welding of this jack stand; it’s not that great. So, we don’t recommend you to use it at its full weight capacity. It is a good practice to use it for under capacity applications. However, they are more than fine for lightweight applications. 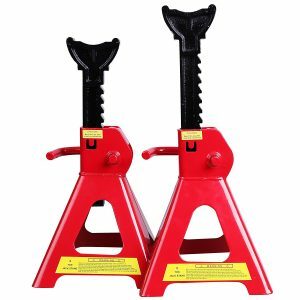 Cartman 3 Ton Jack Stands is the best one you can use for your personal cars, considering its price. But make sure that you use it for light vehicles only. I’m pretty sure that the above list of the best and safe jack stands is more than enough to serve you. However, I would like to give you some more inputs on how to buy a good jack stand. We will go through this jack stand buying guide. I will explain to you some of the common questions customers have in mind before buying a jack stand. You might also be going through some of these decision-making processes. The material defines the build quality of any product. For a product which is designed to hold tons of weight, build quality is the most important thing to consider. That’s why I have put this one as the first point in this guide. Moreover, the material also determines the weight of your jack stand. But the best thing is that it’s a simple choice to make. This is not a hard multiple choice question. You have basically two options- Aluminium or Galvanized Steel. Both are good in their own ways. Selecting one from the two solely depends upon your requirement and of course, budget. Galvanized Steel Jack Stands: These heavier jack stands are the prime choice of most of the garage people. Its a mechanic’s love. Why do People prefer Steel? Steel is known for its quality as a metal. Although it is heavy, it is durable and the strength it offers is amazing. What’s the use of having a strength less jack stand? The heavy weight may be a concern for some people. We would recommend galvanized steel jack stands to those who are regularly working on heavy vehicles and occasional uses.One thing to note is that steel might rust. So make sure that you get galvanized jack stands, which are rust-free. Aluminum- Aluminium is lighter than steel and there you have the advantage. Some people complain about the heaviness of Steel Jack stands. Aluminum jack stands are for them. 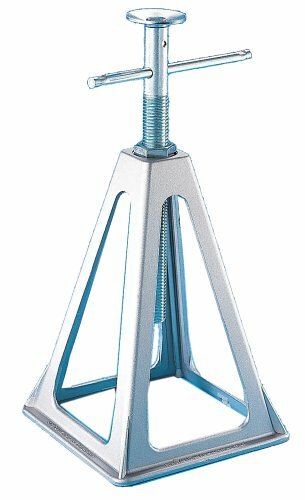 It is very easy to toe around and move around Aluminium jack stands. Mechanics often use this for smaller vehicles. If you have a small vehicle, it is not a bad idea to choose an Aluminium jack stand. Unlike the ‘normal’ jack stand, this one won’t rust. 2. What’s the Tonnage/ Size of Jack Stand? Size or tonnage of the jack stand is basically the weight a jack stand can support safely. This is the most important factor when it comes to the safety of the jack stand. There have been many instances when the jack stands failed when improperly sized jack stands were used. You know what it means. You have to give extra care on the tonnage of the jack stand. How do you determine the size of the jack stand? Well, for this you need to know your car’s weight. Normally the weight of your vehicle will be given in its manual. For better safety, always select a jack stand which can support 25% weight more than your car’s weight. Moreover, there’s no logic in choosing a higher rated, say 12 Ton jack stand for 3 Ton requirements. Thing to Note: Most of the best jack stands come in pairs. Their weight rating is for the pair. For eg. when a jack stand says it has 3 Ton capacity, that means each jack stand support 1.5 Tons individually. Combined, they support 3 Tons. But, remember this is not the case always. So it is a good practice to verify the weight capacity of the jack stands before purchasing it. 3. Which is the Safest Lock Design? There are basically three types of lock designs for jack stands – pin-in-hole locks, double lock jack stands, and ratchet style lock. Rachet Jackstands: These are easily adjustable jack stands which use supporting bar to adjust the heights. They are good for fine adjustments. Pin Type Jack Stands: They have pins which make it impossible for the jack stand to fail. This is the best you can get for heavy duty applications. 4. How to choose the Ideal Range for Jack Stand? There are two things to consider for choosing the ideal range for jack stands. One is the minimum height and the second one is the maximum height. As the name suggests, the former one gives the minimum height the jack stand provides and the later one shows the maximum height to which the jack stand can rise. The maximum height is more important than the minimum height. Why? You need to have a maximum height which provides you with enough space to go under your vehicle and work comfortably. Most of the mechanics recommend going only 80% of the maximum height of the jack stand. That means, if your jack stand has 15″ maximum height, don’t go above 12″ for better safety. The ‘minimum height’ indicates the lowest height you can use the jack stand. You won’t be able to use a jack stand for a lesser height than this. 5. Fixed or Adjustable Jack Stand? I should not have added this point in this article if I haven’t seen the same questions is some online forums. There is only one answer to the question; go for the adjustable jack stands. There is no meaning in choosing a fixed jack stand. You don’t know which vehicle you need your jack stand. Nothing more to say, go for the versatile adjustable jack stands. Jack stands are made through welding. It means different parts are assembled together through welding. If the welding is not proper, there is a higher chance that the product may fail. That’s why we trust in good jack stand brands which deliver quality products. Make sure that the welding on the jack stand is of top quality. It should run at length and that too without any breaks or gaps on it. There will be a lot of welding points on the jack stands. The lesser the welded parts, the better the jack stand is. The higher the base width, the more stable is your jack stands. Base width is another crucial aspect when it comes to the safety of the jack stand. If the base construction is poor, the jack stand will fail in distributing the weight evenly. On the other hand, a good base will ensure proper distribution of the weight and offers more stability. One thing to note here is that you might find it a bit hard to place wider base jack stands on the ground. So, care should be given while choosing the base width. You shouldn’t end up with an inaccessible jack stand while giving more importance to safety. Adjustable jack stand is best. Care should be taken for the tradeoff between base width and ease of use. Look for the lifting capacity. You should be able to get underneath the vehicle; that’s the basic function of having a good jack stand. Locking mechanism- Go with the safest ones. Go for jack stands with better safety measures. Did You Get the Best Jack Stand for Your Car? I think your search for the best car jack stand might have ended here. We will be happy if have already found your product from the above reviews itself. As a matter of advice, always make sure that you read the manuals before using these jack stands. Otherwise, there might come some problems while you use them. Moreover, always follow the safety practices while using jack stands. With that, let me finish off. Hope you have enjoyed reading this guide.